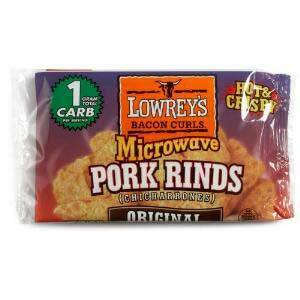 From Lowrey's, "If you like pork rinds, you'll flip over Lowrey's Microwave Pork Rinds. Toss a bag in the microwave and in just minutes, you've got a cracklin' hot, ready-to-eat snack with only 1 gram of carbohydrate per serving. Lowrey's Bacon Curls are available in Original and Hot & Spicy flavors. They’re not only delicious, they’re high in protein, and contain 60% less fat than fried pork rinds. Eat them right from the bag or with your favorite hot sauce, dip, salsa or barbecue sauce."